I moved the article "THE HORROR, Bond traders are white with terror" to my next entry, *****Treasury Yields Accelerating Upwards*****. I also expanded the conclusion to this entry. Financial Sense reports about the US "carry trade" economy. Government Playing "The Carry Trade"
The U.S. government's outstanding debt of $7.3 trillion is mainly short-term. On average, federal debt has a maturity of five years or less [Today the average is maturity is four years or less]. Nearly [over] one-third of this debt will come due in less than a year. By keeping its debt short-term, the government has been able to realize a net decline of 13.4 percent per annum in net interest payments. Instead of being prudent and locking in low interest rates, the government has shortened its debt in order to reduce interest rate expense. While this may save money in the short-term, it could also backfire and raise expenses over time as rates begin to rise. Instead of locking in its debt costs, the government is now subject to the vagaries of the debt markets. The trend in interest rates is up, which means the cost of financing all of that short-term debt will also be rising. This will lead to even higher deficits as rising rates slow down the economy, shrink government tax revenues, and increase its expenses. The U.S. government in effect is playing the "Carry Trade" by financing long-term commitments with short-term debt. Corporate America Playing "The Carry Trade"
Just as the government is short on its debt and long on its expenses, the same mistake is being repeated in the corporate sector. Contrary to popular opinion, the corporate balance sheet has hardly improved. Debt to equity ratios look better thanks to a rising stock market. However, those ratios could deflate as quickly as you can say the word "crash." Recent evidence this year points to a record pace of debt issuance with most of that debt carrying a "floating' rate interest. This debt gets more expensive as interest rates rise. If rates continue to climb as they are now, corporate profits could get squeezed. According to Lehman Brothers, companies worldwide are set to issue more than $1 trillion in floating rate debt this year. Floating rate debt issuance by investment grade companies is up 36% this year. Companies with junk bond ratings are also issuing floating rate debt. The last time there has been this much variable rate financing was back in 1994. In addition to issuing variable rate debt, companies are taking on increasing risk with derivatives. Companies issuing longer-term debt are changing the nature of that debt through interest rate swaps. Between 40-50% of newly issued, long-term debt has been swapped. 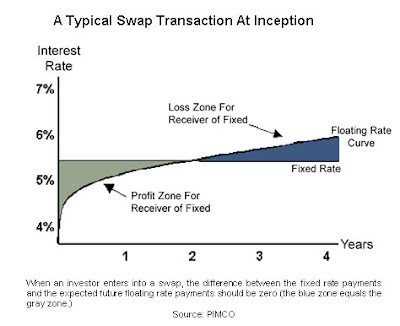 Interest-rate swaps involve the exchange of coupon payments—one fixed and the other floating rate. The interest rate payments are usually paid semiannually. In a swap arrangement, the company agrees to pay the floating rate to its counterparty. This rate is usually the six-month London Interbank Offering Rate or Libor. If rates rise, interest expense rises and companies could find it difficult to reverse such transactions. Most swaps trade over the counter rather than on exchanges, which makes them less liquid. According to Raj Dhanda, Morgan Stanley's head of global debt syndicate, about half of all U.S. corporate debt is floating rate. This makes the corporate sector vulnerable to rising interest rates more so than in the past since debt levels today are much higher. According to Standard & Poor's, companies have only marginally reduced debt from 52.7% in 2000 to 52.5% at the end of 2003. Examining the footnotes of companies ranging from GM, GE, Ford and Wells Fargo to Citigroup reveals that companies have turned to variable rate debt to reduce borrowing costs [All these companies are dead meat]. Although companies don't like to reveal how much of their debt is variable, they oftentimes disclose its impact. Citigroup disclosed that pretax earnings could decline as much as $426 million over the next year, if interest rates rose by 1%. The automobile industry is a big user of variable rate debt and interest rate swaps [which is why GM's bankruptcy is producing interesting results (see next article)]. Ever wonder how auto companies could offer such low finance rates or zero percent car financing? The answer is variable rate debt and interest rate swaps. This is what has driven profits recently at Ford and GM. Ford, which recently reported that second quarter net income tripled to $1.17 billion, made that profit entirely from its Ford Credit unit. The No. 2 auto maker lost money in its core car-making business worldwide. GM's second-quarter earnings were driven almost entirely by a record performance at GMAC (General Motors Acceptance Corporation). Reuters asks what's going on in the interest-rate swaps market? What's going on in the interest-rate swaps market? Swap spreads are still under pressure. One derivatives veteran offered the interesting observation that the GM bankruptcy had led to the spread widening. The GM filing would have negated existing swap contracts. GM is (was) an active issuer and probably had been receiving from the street as they turned fixed rate issuance into floating rate debt. With the bankruptcy filing those trades no longer exist and the street is left paying no one. Ergo the street is long ["long the bond" = "short the swap" = the floating-rate payers in interest rate swaps = guaranteed annihilation in a hyperinflionary environment]. They have to pay swaps to hedge the exposure of that legally created long position. The first thing to grasp here is the ubiquity, in financial circles, of the interest-rate swap, where you can turn an income stream from fixed-rate into floating-rate or vice versa. Let's say that GM issues a 3-year bond at 8% per year: it might then go along to an investment bank and swap that 8% coupon payment into say Libor plus 400 basis points. Essentially the bank commits to making all those 8% coupon payments, while GM now commits to making payments which fluctuate according to prevailing interest rates. With interest rates low, GM was actually making money on these swaps: the banks would pay it the difference, every six months or so, between the higher fixed rate and the lower floating rate. But now that GM is bankrupt, the swaps have been torn up, and all those future payments which the banks were expecting to make no longer have to be made. Of course, banks always hedge their positions — which means that some other counterparty will continue to pay them the money they were expecting to have to pay to GM [However, if rates go up (they will), the flow of money will reverse, and banks will have to start making ever larger payments to that "other counterparty"]. That's what Jansen means when he says that the bank "is long [the bond]". Now that money isn't going to GM, the bank will want to hedge its new long position, which essentially means selling that cashflow in the swap market. The market in interest-rate swaps is enormous — orders of magnitude greater than the market in credit default swaps — and, like most markets, it's done some pretty crazy things over the past year, with long-dated swap spreads going negative for most of that time. Because there aren't any systemic implications of things like negative long-dated swap spreads, and because the swaps market is a zero-sum game where for every winner there's an equal and opposite loser, policymakers and bloggers and pundits haven't paid much attention to it [Not me, I recognize it as the threat which will bring down the US financial system]. That's fine, they don't need to. But it's really important for fixed-income traders, which is why the likes of Jansen spend a lot of time looking at it. I wrote about the Interest rate derivates nightmare facing America in my article *****fed planning 15-fold increase in us monetary base*****. My reaction: Interest rates swaps will magnify the damage caused by the dollar's collapse. 1) On average, federal debt has a maturity of four years or less, which means over one-third of this debt will come due in less than a year and need to be rolled over. 2) About half of all US corporate debt is floating rate. 3) Since debt levels today are much higher, the corporate sector is extremely vulnerable to rising interest rates. 4) Since the automobile industry was/is a big user of variable rate debt and interest rate swaps, GM's filing for bankruptcy will negate these existing swap contracts, and leave the street is "long the bond and short the swap". 5) Interest rate swaps offer the potential for unlimited losses. In a dollar collapse, anyone "short the swap" (the floating-rate payers in interest rate swaps) will be crushe d into oblivion. Conclusions: Rising Treasury Yields are going to wreck massive damage on the US economy. Right now, interest rates are only slowly moving upwards. However, once fears of a dollar collapse reach critical mass, they will skyrocket. Financial institutions around the world will realize that a collapse makes the "hold to maturity" strategy a losing propersition. They will then begin dumping their trillions of toxic US debt at firesale prices, simply to escape the dollar's devaluation. Fear of inflation will be the biggest factor driving interest higher and causing stress in the interest rate swap market. So printing money to help banks/companies pay their swap obligations would just feed this fear and make things worse. For more on the negative feedback loop caused by quantitative easing, see *****Treasury Yields Accelerating Upwards*****. A) The notional amount of interest-rate derivatives outstanding in the second half of 2008 was $418.7 trillion. This means that, when the dollar collapses, those "long the bond" (the floating-rate payers in interest rate swaps) will be the hook for over one quadrillion dollars every quarter. That's over 1,000,000,000,000,000 dollars every three months. Of course, the US financial system and most of corporate America will go under long before it reaches that point. There will be few survivors of this interest rate swap apocalypse. This entry was posted in Background_Info, Currency_Collapse, Wall_Street_Meltdown. Bookmark the permalink. Eric do you envision the United States dissolution? Or is this a Apocalypse in a financial sense only? Will this be a war we fight where the streets look much the same as we see today or will the country take on a 3rd worldish tint with madness and crime sweeping the nation? From what I have read of Germany in 1923 it was bad but not everyone suffered. Do you feel like Peter Schiff in that you recommend folks leaving the US? I don't see how this is isolated to the United States. Sure there are other currencies but this same scenario is likely to repeat in the UK..maybe all of Europe. Besides the world holds so many dollars...who would be their to soak them up should someone like China decide to dump them. It will instantly trash many sovereign funds. All in my opinion of course. "[Shorting stocks is betting against inflation, don�t do it]. " I disagree with this statement. Both stocks and bonds will crash and we will see very high prices in things(not debt). I think people who say the stock market will rise high while bonds crash low are wrong. If the govt. could print enough to cause a large rally in the stock market, they would also save the bond market. But they can't and right now they are struggling to keep one of these markets afloat at a time. And this is proof that this rally in stocks will not go far, because if it were able to go far, the resources(printed dollars) the government used to cause a massive rally in stocks would also be used in the bond market to keep yields down. That's why I think the idea of a massive rally in stocks and massive drop in the value of bonds can not happen at the same time. If the govt. could cause a massive rally in stocks, it would not let the bond market tank. So this stock market rally we are experiencing right now will not go far. Right now the govt. is trying to choose which holes to plug and right now the hole of choice is the stock market. But more holes are appearing and soon the govt. will not be able to print enough to plug the massive amounts of holes. And both the stock and bond market will crash. How soon? I say before this year ends. Contrary to what most feel/say, i think the market is more easier to play and read now than it was when it was booming. The govt. only has so many fingers and more and more holes are appearing in the dike. In this analogy, the govt's fingers are it's printing presses and the holes are all the defaulting debt. The defaulting debt removes money from the money supply faster than the printing press can print that equal amount of money and the gap in the speed of the two is widening, meaning the defaulting is growing faster and faster while the printing is running at it's top speed and has peaked(without larger denominated bills). and of course rising prices will come through rising borrowing costs being transferred to consumers through rising consumer prices. but how can default faster than the printing press? print money only need to press the "enter" button on a computer..
there is no backup for US consumer, so USD to hyperinflate against what Eric?? Other countries depends on dolar on their import. It could be a lot worse than the third world. Things in post-Soviet Russia were probably rougher than, say, Indonesia. If you think a dollar hyperinflation is coming, the profits would be very limited in shorting. You would be much better off buying beans, butter, and bullets. "but how can default faster than the printing press? print money only need to press the "enter" button on a computer.."
Wrong, wrong wrong!!! You are confusing credit with base money. The Federal Reserve Note is tangible and is minted and checked for errors and has to travel by plane or Armored truck to get from one place to another which takes time(although not as long as it would to find, dig up, refine, mint and transport physical gold/silver from one place to another but allot longer than it does to press a button on a keyboard to transfer the illusion/thin air money from one side of the earth to the other which takes less than a second with internet). It's creation takes a longer time to create than credit which is what you just described when you said by pressing the "enter" button on a computer. I know allot of people confuse the term "creating money out of thin air". This term refers to the creation of credit not the tangible Federal Reserve Notes. Some people use the term wrongly and it promotes the false meaning. Right now we are having trouble creating money out of thin air as the thin air money has grown too large for the tangible money to follow and so the govt. is doing it's best to create more and more tangible money so that we can continue using thin air money. But they will fail as the destruction of thin air money is also done on the computer at the same speed as it's creation. Operation i wasn't suggesting shorting, i was just saying that stocks and bonds will crash together and at the same time we will have rising prices on things. "Fear of inflation will be the biggest factor driving interest higher and causing stress in the interest rate swap market. So printing money to help banks/companies pay their swap obligations would just feed this fear and make things worse." Again I disagree here but kind of agree at the same time. First of all Massive uncontrollable defaults is/will be the biggest factor driving interest rates higher. And the "Fear of Default" is a factor but a lessor factor than the massive uncontrollable defaults. When The Fed buys government bond, do they print paper money (FRN) or they just press the enter button on their computer Eric? Where does the base money come from? Can you compare your reasoning for higher prices with the stagflation period in the US? Also I read yesterday that steel companies (ThyssenKrupp, etc.) will raise their processed steel prices because of higher refinance cost which follows your reasonable logic. Your key line for me is: Prices in a credit contraction will rise, because at some point not being in business is better business when you have to finance you production. Is this correct? Bond traders in panic? Last time I checked bond traders can be short or long. Only half are in panic, and half are having the time of their life. I think your brain only is capable of seeing the negative and disasterous side of any given trades. All trades have two sides. Two. From what I have read of Germany in 1923 it was bad but not everyone suffered. 1) Germany had manufacturing sector, the US doesn't. 2) In the US there is an aging population dependent on medication. Do you feel like Peter Schiff in that you recommend folks leaving the US? If you can, I would definitely consider it. I am not sure what will happen, but I have serious plans to visit my sister in Moscow for an extended stay. 1) You start with 250 euros. 4) Closing out short position leaves you with 1058 dollars. By shorting stocks, you could end up with more dollars, but, if those dollars are worth far less, you will be losing money in real terms. Shorting only makes sense with a stable dollar. (If it were possible to short stocks using gold and not dollars, then it would be worth it. China has already surpassed the US as the largest car market for four months running. If the yuan is strengthened (China drops the dollar peg) and its purchasing power increases, the Chinese consumer will easily replace the struggling US consumer. USD will hyperinflate against Euro, Russian rubble, and chinese yuan. You disagreed with me when I said shorting stocks was a bad idea. That would suggest that you think shorting stocks is a good idea. Since most money is now in the form of electronic records, rather than paper records such as banknotes, open market operations are conducted simply by electronically increasing or decreasing ('crediting' or 'debiting') the amount of money that a bank has, e.g., in its reserve account at the central bank, in exchange for a bank selling or buying a financial instrument. Newly created money is used by the central bank to buy in the open market a financial asset, such as government bonds, foreign currency, or gold. If the central bank sells these assets in the open market, the amount of money that the purchasing bank holds decreases, effectively destroying money. The process does not literally require the immediate printing of new currency [If a bank credits money into your bank account, it doesn�t mean you immediate have more money in your wallet. First you have to go to an ATM and get the money. This is the same principle at work]. A central bank account for a member bank can simply be increased electronically. However this will increase the central bank's requirement to print currency when the member bank demands banknotes, in exchange for a decrease in its electronic balance. The bond traders for primary dealers are being required to buy 200 billion dollars of treasuries every month. It is very hard to be short treasuries under those circomstances. The reason they are panicking is that investor demand for treasuries is much less than 200 billion dollars a month, which means their long position in treasuries is growing at the same time as treasury prices are declining. I would panic too if I was bond trader for a primary dealer. Agreed, and those on the losing side in this case (Bond traders for primary dealers) are panicking. "You disagreed with me when I said shorting stocks was a bad idea. That would suggest that you think shorting stocks is a good idea." I wasn't disagreeing that shorting stocks was a bad idea. I assumed by you saying: "[Shorting stocks is betting against inflation..." that you believed stocks would rise. And I was disagreeing that stocks would rise(even in dollar terms) regaurdless of the price of everything else rising much more. I'm saying the DOW is headed lower than 3000. I believe you're saying that the DOW will rise higher than 1400 but at that level it won't matter because prices will rise much higher to wipe out gains on investements in the stock market. I gave an explaination of why I believe the DOW can not rise high while bond yields remain low and i basically said that if the govt. could print enough to bring the stock market to new highs, it could also print enough to stop bond defaults and to keep bond yields down, but I believe the govt. can NOT print enough to save either of these markets and bond yields will rise at the same time the stock market drops to new lows. It's funny though because i do agree with you that shorting stocks is a bad idea for the same reason. Maybe i misunderstood your reason for saying shorting stocks is a bad idea. I thought you were saying that anyone that shorted stocks would loose the short bet because in dollar terms stocks would rise but that's not what you were saying. You were saying basically what i agree with, in that shorting stocks is a bad idea because any gains you make on your correct short bets will be wiped out through the rise in price of other things like food and energy and neccessities. But my reasoning for you thinking stocks would rise goes back to your blog about Dollar Devaluation bringing illusion of prosperity. In that blog you said stocks would rise(in dollar terms). I disagree. Not sure if you still hold that belief. I still believe stocks are going up in dollar terms. There may be an inial drop as investors panic out of service sector stocks (stock could possibly even drop back below 5000), but ultimately the DOW is headed 20,000 and beyond (driven up mostly by commodity stocks). It is what happened in Zimbabwe. Okay, i see now. Because i know commodity stocks will rise so in this sense yeah the stock market will rise but i'd like to include that other than rising prices on neccessities wiping out any gains from investing in the stock market, another reason to not invest in the stock market even when it is rallying is because the rally will be brought on by massive defaults. I believe spot gold is rising because of massive defaults in the paper market. And when i say "default" I don't mean that investors aren't able to get the physical gold on demand(we've always had those defaults and defaulting on the physical gold isn't what causes the spot price to rise, defaulting on the settlement is what causes the spot price to rise), i mean that investors are not even able to get the currency settlement paper cash(FRN) of the bond/debt/stock. So even though the face value of the stock/debt/bond is rising, the higher it rises in value the more illiquid it becomes. So stay away from any bond/trust or debt all together and hoard your physical gold & silver in your personal private possession. "Your key line for me is: Prices in a credit contraction will rise, because at some point not being in business is better business when you have to finance you production. Is this correct?" I don't really understand the question. But I'll say that this is all based on survival. In a credit contraction where borrowing costs are rising, if a company wants to make the money to pay the borrowing costs to stay in business, it has to get the money from somewhere. So far it has been doing so through the bailouts but the problem is the borrowing costs are rising because the defaults are rising and the bailouts need a bailout themselves. When the bailouts fail(which is when the defaults largely out pace the printing press), the money can be pulled in either through raising taxes or raising consumer prices. The problem with raising taxes is that people don't have to pay taxes and most people don't. So the only other option is to raise prices. And this is what will happen, especially since there are still many people who can afford non-neccessities. On the other side of the survival inflation spectrum, the side with massive amounts of Zimbabwe size bills flooding the streets, if a man is selling 5 apples, he will sell his last apple for more than he did his other apples in order to survive. If humans didn't have the instinct for self preservation, we'd starve to death and allow massive amounts of dollars to flood the economy without raising the prices of all the things those dollars are devouring. But because we have the instinct to survive we do what we have to and charge more for necessities that are depleting so we can survive.